13 more days until Christmas, but only 12 more days until I need to have a lot of my handmade Christmas gifts finished. I should probably be spending every bit of free time on all the gifts yet to make, but that just isn't feasible. The heaping mound of clean laundry waiting to be folded was becoming too big of a distraction. I also have other projects that I've committed to during this time as well, so my journey to balance it all continues. 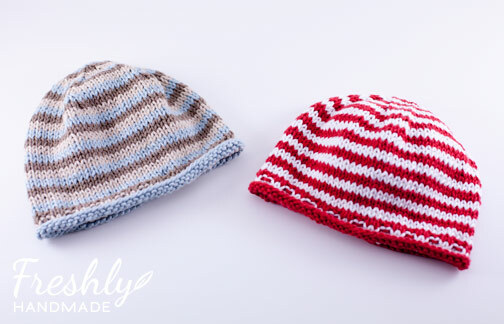 I recently finished these boy and girl knit baby hats for a friend to give as baby gifts. It's really been a while since I've picked up my knitting needles, so it was fun to get back at it. I have another small knitting project in the works, which is one of the items on my Freshly Handmade Christmas list. I'll share it when it's complete. Today, I plan to finish some holiday baking and continue working on my sewing projects.